Tall Hex Shelving in Metallic Blue Glaze. 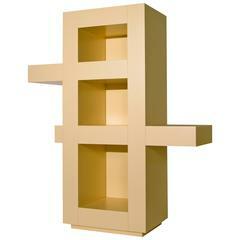 Modular Aluminium Bookshelf. 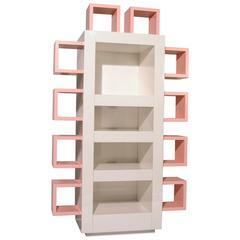 Cioccolanti is a bookcase whose taste is refined, sweet and incredibly unique. It envelopes in its symmetric folds the magic pages of a good book, the scent of the most beautiful flowers and the boundless world of the objects that speak about you and that you want to make speaking of you to the ones admiring it. Long-limbed stage of what most represents you; it has a hidden and unexpected side and a thin and carefully refined profile. A light and shining cocoa-flavored sheet. This is an artisanal and made to order product. Customers can personalize the item in colors, finishings and dimensions. altreforme is an Italian company that produces collections of high-end and contemporary taste furniture and accessories made in Italy, and made to measure projects mainly made of aluminium, aimed at those who like to stand out, choosing to surround themselves with original and refined, but also environmentally friendly products. altreforme was founded in 2008 as an ambitious diversification project of Fontana Group, since 1956 the world leader in the design and production of luxury cars aluminium bodies, including Ferrari and Rolls Royce. altreforme has won major international awards as the Elle Decor Design Award, and every year, in the prestigious context of Salone del Mobile in Milan, presents new exclusive collections. The catalog collections are signed by famous designers and archi-star: Aziz Sariyer, Marco Piva, Garilab, Elena Cutolo, Antonio Aricò, Serena Confalonieri, Marcantonio, Alessandro Zambelli, Zanellato/Bortotto and by two extravagant Fashion brands like Yazbukey and Moschino. The dimensional control, proper of the car bodies production process, becomes an elegant and futuristic cabinet.